George Albert Converse (13 May 1844 – 29 March 1909) was an officer of the United States Navy, who was noted for his contributions to naval engineering. He saw service in the Spanish-American War. Born 13 May 1844 in Norwich, Vermont,where he also attended Norwich University and was a member of Theta Chi Fraternity. Converse was appointed Midshipman 29 November 1861. He was a pioneer in the use of electricity on oard men-of-war, in experimentation with and introduction of smokeless powder in the Navy, and in development of torpedo boats. In command of Montgomery (C-9) from 1897 to 1899 he took an active part in operations off the coast of Cuba with Admiral William T. Sampson's squadron during the Spanish-American War. 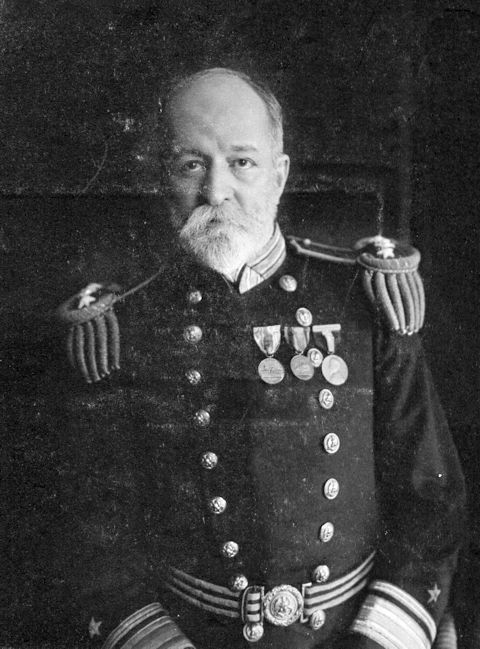 From 1903 to 1906 he served successively as Chief of the Bureaus of Equipment, Ordnance, and Navigation, continuing as Chief of the latter Bureau for a year after his retirement in 1906. He died in Washington, D.C., 29 March 1909. Two destroyers have been named USS Converse in his honor. George Albert Converse was born 13 May 1844 at Norwich, Vermont and was appointed midshipman 29 November 1861. He was one of the first officers involved in the introduction of electricity aboard men-of-war and pioneered in experimentation with and introduction of smokeless powder in the Navy. In 1876, he was also instrumental in obtaining Lightning (Steam Launch No. 6), a spar torpedo boat designed by Nathaniel G. Herreshoff. During the Spanish American War, Converse commanded cruiser Montgomery operating with Admiral William T. Sampson's squadron off Cuba. Promoted Rear Admiral on 21 October 1903, he was appointed Chief of the Bureaus of Equipment, Ordnance, and Navigation in turn. Rear Admiral Converse was considered one of the ablest officers in the Navy and was well known as an expert on ordnance, especially regarding to torpedoes. In 1904, when only the first sixteen “torpedo boat destroyers” were in commission, President Theodore Roosevelt ordered the Navy to convene a board under his leadership to “consider the types and qualities of torpedo vessels and their machinery.” The board developed a functional description for future destroyers, which was first applied in the design of the Smith- and Paulding-class “flivvers” of fiscal years 1907–11. Rear Admiral Converse died 29 March 1909 at Washington, DC. Clemson-class DD 291 was also named Converse. WASHINGTON, March 31, 1909 – President Taft, Secretary Meyer, Assistant Secretary Winthrop, Admiral Dewey and about fifty ranking officers of the United States Navy this afternoon attended the funeral service at St. John’s Episcopal Church of Rear Admiral George A. Converse, the Chief of the Bureau of Construction, who died at his home here last Monday. With full military honors the body was laid to rest in Arlington Cemetery. Covered with the flag of his country and bearing the dead Admiral’s epaulettes, belt, collar and sword, the coffin rested on a bier in the church surrounded by beautiful floral tributes. The service was conducted by the Rev. Dr. Roland Cotton Smith. Escorted by four companies of Marines and two companies of Bluejackets from the USS Dolphin, the body was taken to Arlington where “Taps” was sounded and a volley fired over the grave.